As you know, this blog is all about my attempt at tracking down all of the toys of my childhood as a kid who grew up in the 80's, the absolute best decade for toys. But this one is a bit different. 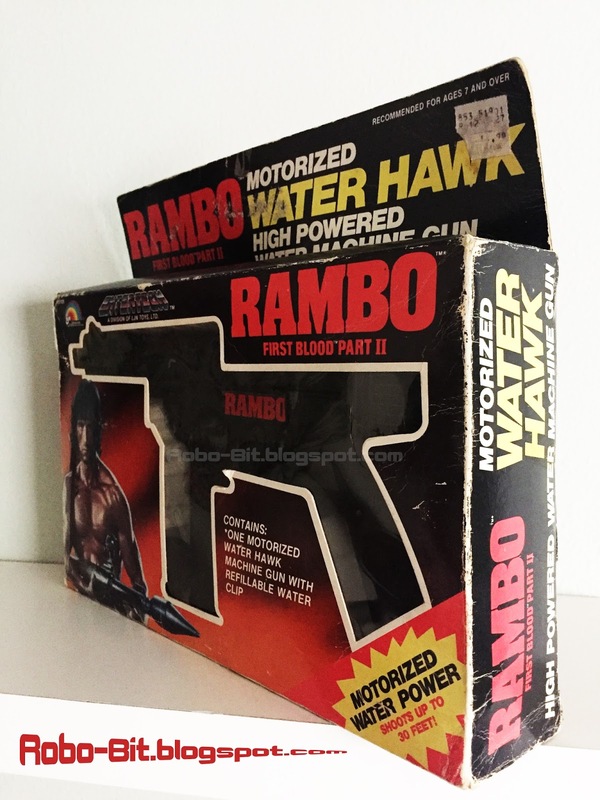 I never actually had this gun, but rather one of my best friends did, a few actually, and I remember playing with them often and just thinking how amazingly real they looked for water guns. And I mean, just the fact that they were a Rambo toyline made them automatically awesome, and these bring back a flood of memories of a time when kids actually had to play outside. When I decided to begin tracking any of these Rambo guns down, I soon realized that it wasn't going to be easy. These have become exceedingly scarce and highly sought after in the collectors market. 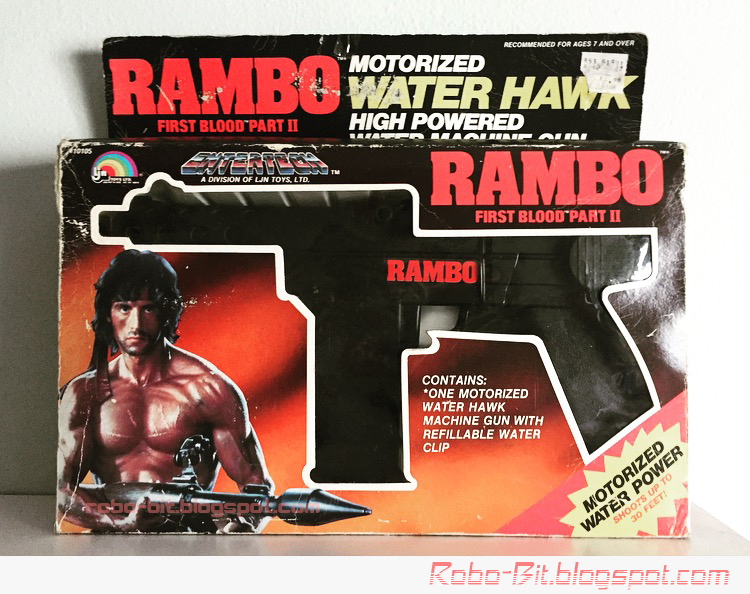 Much more so than the Rambo figures or toys from Coleco. So I had quite a task ahead of me. The thing with these toys by Ljn and Entertech is that they're so rare that they almost never pop up, and when or if they do, the prices are outrageous. For example, that M-60 machine gun or even the rocket launcher (not pictured) will demand anywhere from $300-$1000 each. Yea, no thanks. I want them, but not "that" bad. More often than not, the go-to for collectors are the online sites, which I frequent on a daily basis. But then I came across a group on FB, one of many, that caters to older guys like myself and who are in it for the collecting aspect and not the flipping. While I've done some selling in this group myself, I've never actually purchased anything from anyone else. Then one day someone posted a few images of some items they were selling at their local toy show, and of all the things that were pictured, this caught my eye. I immediately contacted them and inquired about the price and condition. They were honest and upfront about the condition. As you can see in the photos, the box is a bit beat up, but it's not a deal breaker for me because for the most part, it's still in tact and in decent shape. However, the gun is still in it's original tray and has never been used, played with or taken out of it's enclosure tray. The price was extremely fair, when you consider that the average going rate for this sucker is anywhere from $100-$150 typically. Let's just say I got it for far below that, and now this is in my hands once again. While I have yet to ever come across the Bow & Arrow Set, Military Set or Action Playset, and I'm not entirely sure if they were ever actually produced, the one that actually does pop up is the Water Hawk surprisingly. But again, never for a decent price. 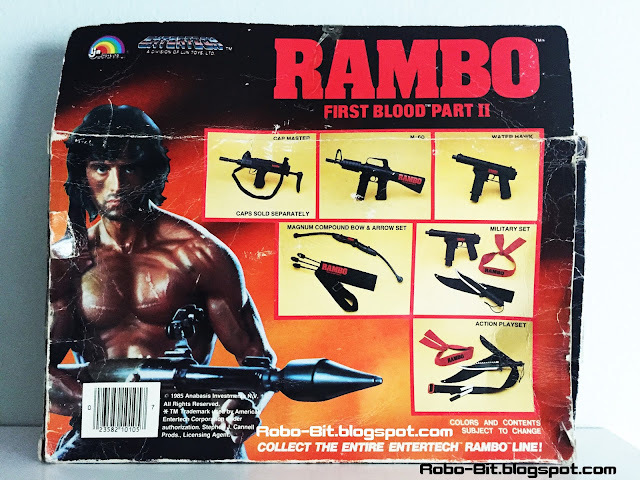 There are quite a few Rambo toys from various companies and toylines to sift through, and I'm discovering that there are quite a few gems I seriously missed out on back in the day. But it's been a fun journey and I hope that you stick around for the rest of it.